Meanwhile, here in North Carolina, two major new outlets blasted prominent Tar Heel Republicans for their performances in the Kavanaugh saga. The head of the North Carolina Republican Party calls one of Brett Kavanaugh’s accusers “a criminal” who “should go to prison.” And we wonder why women are hesitant to report sexual assault? How many women decide to remain in hiding when they hear comments like that? Republicans, from President Trump on down, have questioned why Kavanaugh’s accusers stayed quiet about the Supreme Court nominee for so long. But with his tweets about Swetnick on Sunday, Woodhouse himself becomes the living embodiment of why a woman might keep her secret hell to herself. The scrutiny that Kavanaugh’s faced in his confirmation has been intense. But that’s just the way things are and given his experience – as a lawyer working with Ken Starr’s investigation of Bill Clinton, working in the White House and as a federal judge – shouldn’t have been a surprise or anything he’d be unprepared for. When that scrutiny reached its height and put him to the test, Kavanaugh failed to exhibit the kind of behavior appropriate of a justice on the highest court in the land. He revealed that he hasn’t left his past – as a political operative – behind. The pettiness boiled over. When questions about his behavior toward women were at the heart of the hearing, Kavanaugh sought to badger and bully Sen. Amy Klobuchar, D-Minnesota, rather than respond to her question about the nature of his alcohol consumption. While Kavanaugh later apologized to Klobuchar, the earlier exchange was a revelatory demonstration. Kavanaugh has cast legitimate doubt among those who might appear before him in court as to whether he’d be open, objective and fair to ALL. Would they get deliberative justice or a prejudiced reaction? Regardless of what this latest FBI investigation might reveal, Kavanaugh’s behavior in the Senate Judiciary Committee is enough to disqualify him from a Supreme Court slot. 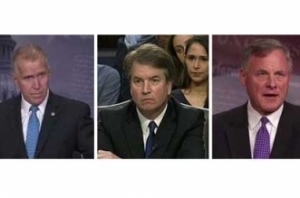 Tillis – and Burr who pledged the during this last campaign he wouldn’t run again and he’d be above partisanship – should reject Kavanagh’s nomination and give the president the opportunity to appoint someone else more suited to the grave responsibilities of a Supreme Court justice.